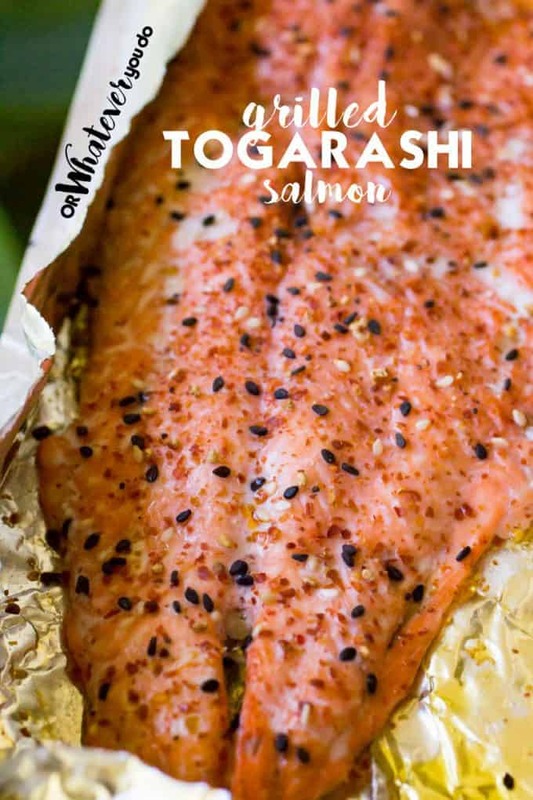 Salmon is in season right now, and you are going to want to get some and make this easy Grilled Traeger Salmon with Togarashi for dinner tonight! 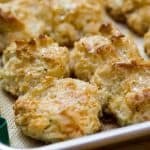 With a few ingredients, you can create a stellar seafood dish that your entire family will love! Flavorful and perfectly cooked salmon straight off the grill! This Togarashi Grilled Salmon is a quick and easy meal to make any day of the week for a light and savory dinner. 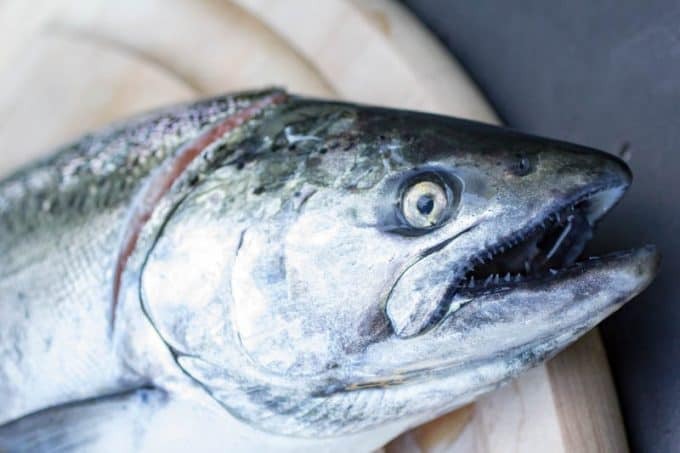 Salmon is fresh and in season right now in the Pacific Northwest! My husband went out the other day and came home with some lovely salmon that we were able to grill up for dinner. I made a very simple Grilled Traeger Salmon that was superb. 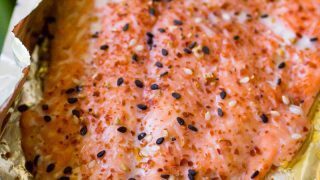 Salmon is so unique as it offers such a rich flavor, so minimal seasoning is needed for a stellar supper. 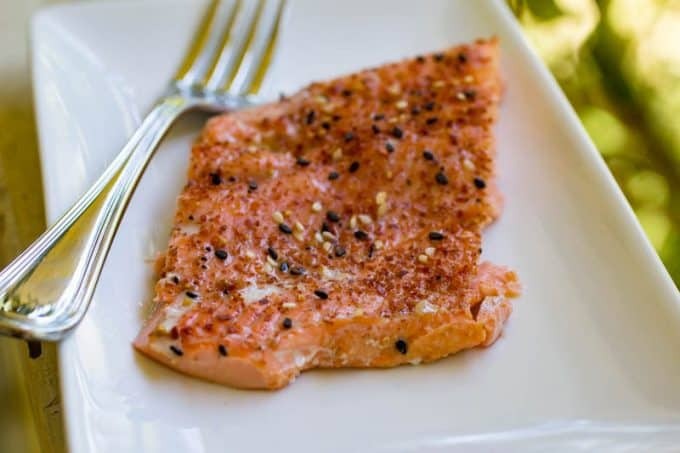 The Spiceology Togarashi seasoning compliments the salmon perfectly and gives it a little spicy kick that is one of my favorite new flavors. 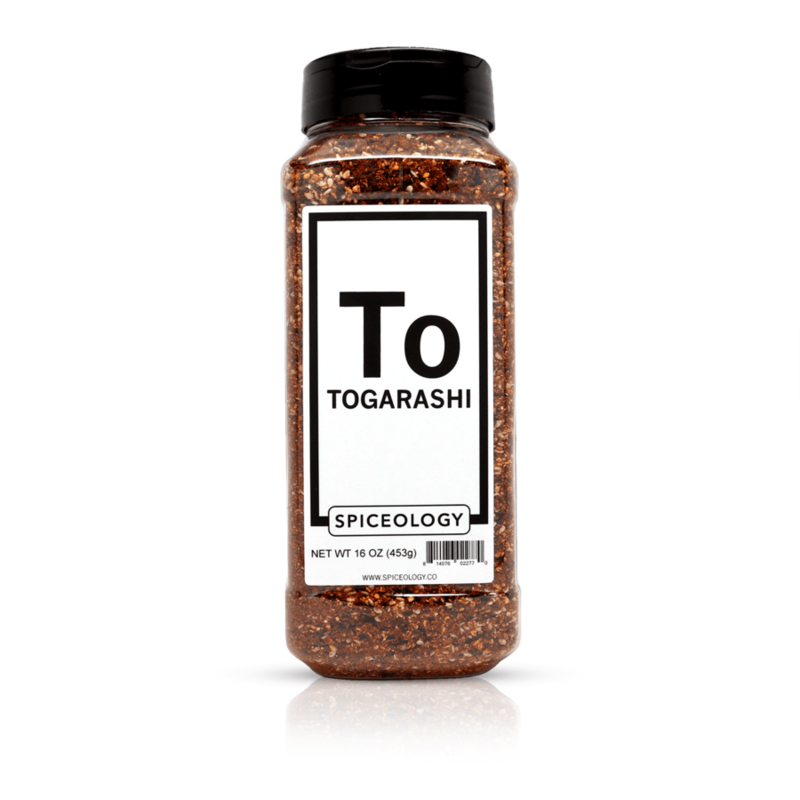 Togarashi, also known as, Shichimi, is traditionally a Japanese seasoning that is made with several different kinds of peppers, orange peel, black and white sesame seeds, ginger, poppy seed, and various other things depending on who makes it. I first tasted it at a sushi restaurant in Sacramento called Mikuni on their Freaky Edameme, and I was OBSESSED. 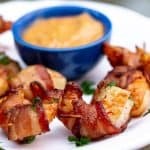 It is a little spicy, and packed with flavor, and I add it on top of all kinds of things. From easy stir-fry like my Chicken Broccoli Stir Fry to noodle dishes like my Sesame Vegetables with Rice Noodles. It would be especially delicious in this Traeger Teriyaki Smoked Shrimp. Salmon fishing is so much fun, if you get the chance to go – take it. Being out in nature, on the water, and waiting to feel that tug on your pole to know you caught a fish is unmatchable. Once you wear out the fish and reel it in, you can see how big of a prize fish you end up with! Nothing tastes better than freshly caught salmon! While I do buy it in the store on occasion, fresh tastes best. I’m so glad that most of the family is able to enjoy such an abundance of fresh seafood here in the Pacific Northwest though! Growing up in the Midwest – it is more than just a novelty to be so close to the sea. It is everything. That makes me happy because it is a fish that is packed full of nutrients that is great for our bodies. Salmon is rich in Omega 3, fatty acids, an excellent source of protein, high in potassium, b vitamins, and more. This fish is a superfood and is excellent to add to our diets when we can. Because we have an allergy in the house we have to take some precautions to make sure that everyone stays safe, but thankfully the allergy isn’t so severe that we have to keep it out of the house entirely. I have seen many people complain that their salmon gets stuck on the grates. With any tender fish, I will say this is a genuine struggle. But, I have a secret weapon! 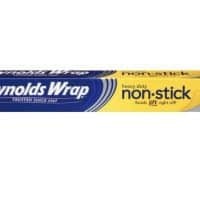 It allows you to protect the flesh of your delicate fish while still cooking it through. 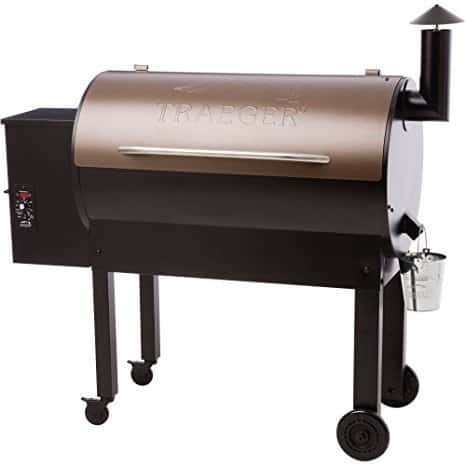 You don’t have to worry about it sticking to the grates anymore, and the fish will still pick up some of the smoky aromas from the Traeger grill. Another thing to remember is salmon, like all fish, cooks quickly. Make sure you are ready when you start to grill. I always make sure to have my aluminum foil out and ready, the fish seasoned and any supplies I might need while grilling. You don’t want to be stranded looking for tongs, and your fish overcooks in the meantime. Be prepared for a quick cook time, and all will turn out well. Depending on the size of your fillets, will give you a variance in times. On average a filet that is around an inch thick will take about 8 minutes at 500 degrees. Or for every half inch give around 4-6 minutes of cook time, at 500 degrees. This timeframe will result in medium to medium-well doneness. You want the internal temperature of your fish to be 140-145 degrees. On the Traeger, I prefer to cook the salmon at around 400 degrees, so the cook time is a little longer. If you plan to cook your salmon on a plank, you need to preheat the plank for around 5 minutes, or until you begin to see it start to smoke or make a crackling sound. Then gently lay your salmon on the plank and cook for 12-18 minutes, depending on how thick your fillets are. The plank will give you a little bit of a longer cook time. You do not have to flip salmon. If you have a grill that heats evenly, you can lay the salmon down, and it will cook through in around 8 minutes give or take if it is around an inch thick. 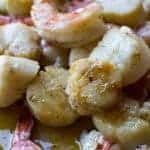 A lot of people like the fact you don’t have to flip through the cooking process as it is a very delicate fish and can fall apart or stick easily. 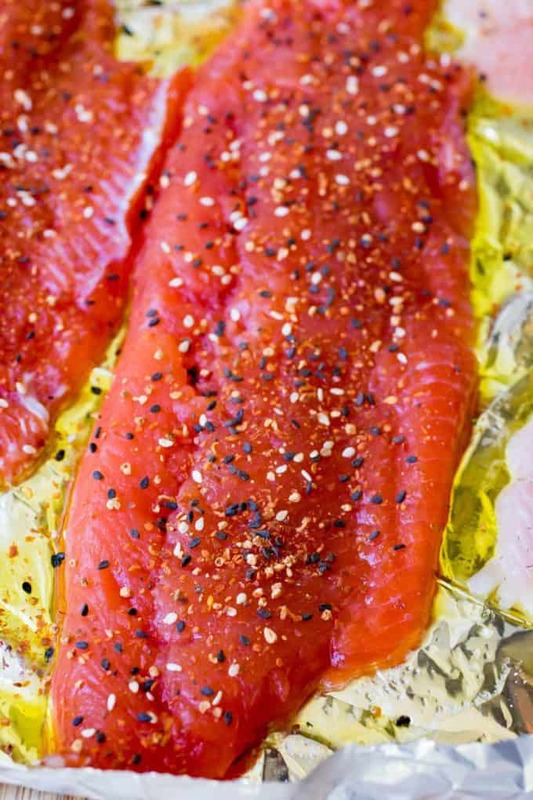 When you cook with salmon, it can be hard at first to know when it is done. 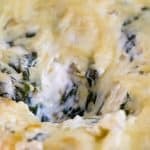 A straightforward way to tell is when you take a fork to it, you will find it flakes very easily. Some people say at this point it can be overcooked, but it means your fish is well done. You can also look at the color of the fish. When it starts out the flesh is more of red color in the raw stages, and as it cooks you will find it begins to turn pink throughout. You want to use a knife and look at the center of the fish to see that it is cooked through and is pinker than red in the center. The guaranteed way is to check with a thermometer and hit that 140-145 degree internal temperature. 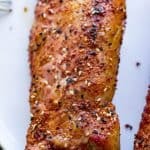 I hope you enjoy this flavorful grilled salmon recipe. 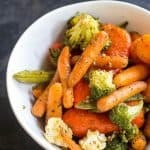 Serve with your favorite sides and let me know how you liked it. 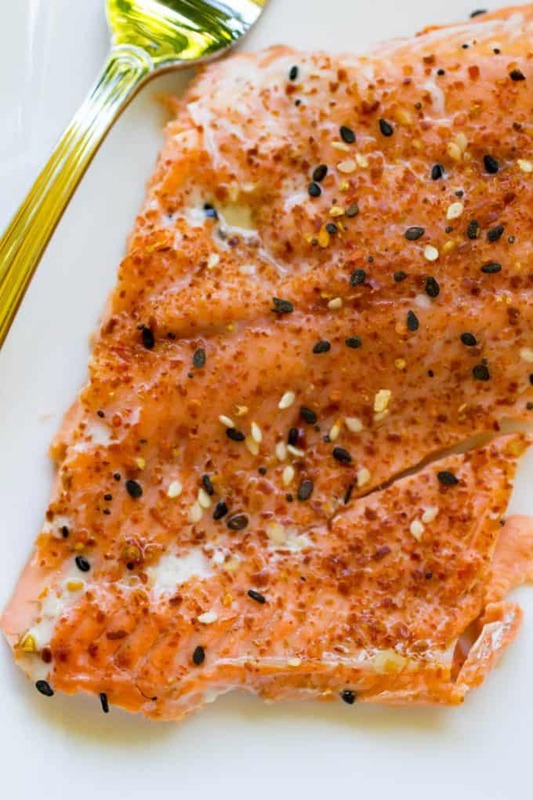 This salmon is SO easy, but is one of my favorite meals! Togarashi is my new "go-to" seasoning these days, so buckle up! it packs a little kick from the spice, but nothing that you can't handle. Place the salmon skin-side down on a sheet of non-stick foil. Gently rub the olive oil into the salmon filet. Sprinkle the fish with the salt and Togarashi. Place the foil and salmon onto the grill, close the lid, and cook for 15-20 minutes, or until flaky and at 140-145 degrees internal temp. 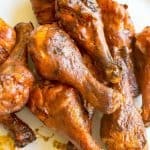 Remove from the grill and serve immediately! to many adds show on your site, so not going to look at it much again. to confusing with all the adds covering content. 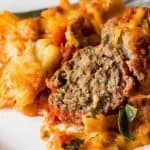 I like your comments and recipes, but to much work to look at them. That’s a bummer because without the ads, there wouldn’t be any recipes here, or a site at all. It takes a LONG time to make this content, and since I am not charging you to access it, I need to make sure it is worth the time and effort I am putting into it. This isn’t a hobby, it is a business. I’m happy to offer you a paid subscription though where I’ll personally email you each recipe and answer your questions about it, ad-free. 😀 Let me know if you are interested and I’ll send you a quote.